Last week I received a very special package from Hank, our friendly UPS driver: three large boxes. He was offhand about the delivery, worried only about the weight and that one of the boxes was starting to come untaped. I, however, could barely contain my excitement. Because inside those three nondescript cardboard boxes lay copies of Game of Sails, a story that had taken the better part of two decades to get published. Flashback to 1994, when many sailors I knew were working toward the 1996 Olympics in Savannah. I began to write notes to myself about two Olympic hopefuls working toward the same lofty goal in completely opposite ways: one working harder than anyone else and focusing solely on going to the Games; the other hoping to coast through on ambition-free talent. Neither approach, I knew from watching the sailors around me, would be successful on its own. And so were born the two characters that grew into Casey and Spencer. I hadn’t yet admitted to anyone (except the guy who would become my husband) that I was writing a novel. So when I volunteered for race committee at the Star/Finn Trials in the spring of 1996, I felt like an imposter. Masquerading as a good-hearted volunteer, my primary motivation was selfish: I wanted to experience how a Trials event felt. Because it never crossed my mind that I would win an Olympic Trials, eight years later. I watched the Savannah Olympics as best I could through the newspapers; the sailing didn’t make it on TV. And for the next four years I wrote, cobbling together a story around my two opposites. I also sailed with a wide array of top-notch teams, learning that every winner has a different style while my writer’s eye roamed the boat park, searching out snippets to show rather than tell the simple joys of competition and sailing and talent. In 2001 I decided to put together my own Olympic effort. 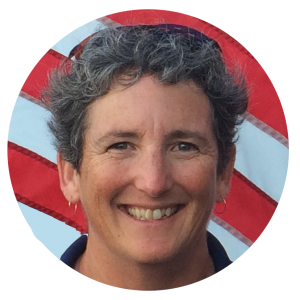 By February 2004, when the Cronin Sailing Team won the Olympic Trials in the Women’s Keelboat discipline. I’d learned a lot about teamwork, talent, and training. But I still hadn’t finished the damned book. When I came home from Athens, I realized I now had all the knowledge I needed to fill in the blanks in my story. 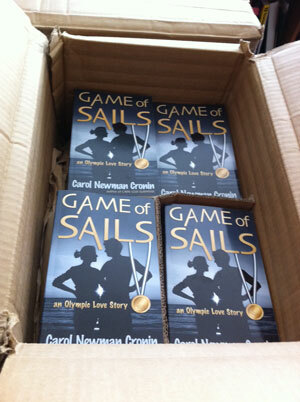 I began to write again, laughing at how thorough I’d been in my research: I’d sailed in the Olympics! But it was too raw, too personal. It wasn’t until after I stepped away from Olympic sailing that I was finally able to finish, transforming the details from my own experience into a background against which my two characters would play out their final scenes. Which brings me up to last week, when Hank delivered the first printed copies—only a few months before the 2012 Games. “Careful, it’s heavy,” Hank warned, as I grabbed the last box from him. Yes indeed—eighteen years of heavy.